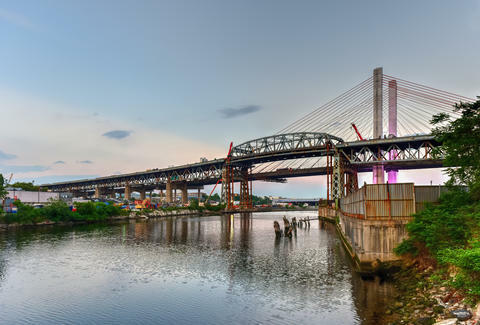 At long last, the time has come to say a not-so-sorrowful goodbye to the city’s least favorite (and least pronounceable) bridge: the Kosciuszko (which, for the record, is pronounced ko-SHOOS-ko in Polish -- though local versions differ). While rumors of the Brooklyn-Queens bridge’s climactic demolition by way of dynamite have been circulating since last January, excitement de-escalated in early July when the city dutifully removed the main segment of the structure and sent it on its way to New Jersey via floating barge -- without using so much as a single explosive. But for the approximate 18,000 New Yorkers hoping to make a serious event of the bridge-burning, hope remains. According to a tentative schedule released by the NYPD’s 94th Precinct Captain Peter Rose, the two remaining sections of the 1939-built bridge will be blown to pieces in a controlled demolition this Sunday, September 10/1. The whole thing will commence at 8am, and while surrounding roads will be blocked off to protect traffic (and the public) from all the flying debris, demolition parties will take place all over the city. The night before the previously scheduled demolition in July, several defenders of the 1939-built bridge spent the evening drinking and reveling illegally on the structure itself, and a full petition was even created in the hopes of commissioning the New York Philharmonic to play the 1812 Overture while the bridge burned. In short, the actual demise of the Kosciuszko this Sunday should be a fairly memorable event: The bridge will not die alone. 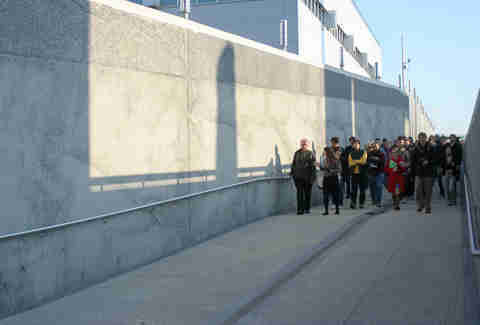 Beginning just past Paidge Avenue in Greenpoint and continuing right up to the waterfront, the end to this short, scenic cement walkway should give way to some pretty impressive views of the bridge-blowout. The walk itself is decked with placards focused on wastewater management -- so you’ll even learn a thing or two en route to the explosion. Bring a blanket and set up shop on the steps at the end of the paved pathway. While you’re killing time until the event, you can toss back some cheap beers at Saint Vitus Bar on Manhattan Avenue, which typically stays open as late as 4am. Like the Kosciuszko, Penny Bridge once spanned across Newtown Creek. Built in 1836, the bridge toll was initially set at one penny -- hence its title. Now, only the abutments of the bridge remain along the bank of the creek, making this a relatively ideal, symbolic space for watching its later-built counterpart come down. To find a viewing-spot, follow Meeker Avenue until it ends directly at the waterfront -- there isn’t much grass, so folding chairs are recommended. Head to Keg & Lantern to drink until 4am when the bar shuts down, and rally a crowd to walk over to Meeker. 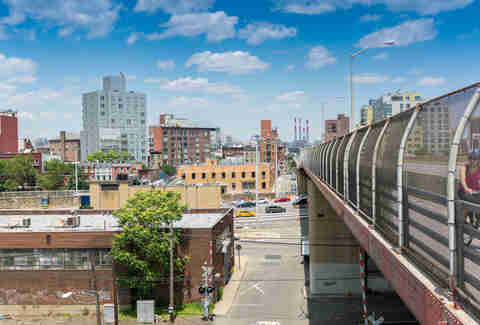 For Brooklyn and Queens spectators alike, the foot of the Pulaski Bridge will offer some excellent viewing-stations. On the Brooklyn side, walk from the end of McGuinness Boulevard, pass the North Brooklyn Boat Club, and stake out a spot directly by the water. In Queens, head past Transmitter Brewing just off of 53rd Avenue, and find yourself a good place to sit. For Brooklynites worried about over-crowding, the view from Queens will be equally exciting, but likely less populated. Before you walk over, grab a drink at Connie O’s with some old-school divey bartenders who are likely mourning the loss of the bridge. If you follow Greenpoint Avenue past Kingsland Avenue, the sidewalk ends almost directly at the waterfront. 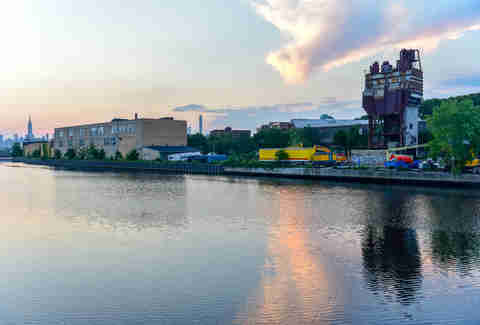 Just a few yards from the Greenpoint Avenue Bridge, there will be a landing space large enough to gather and watch the “show.” The space is fairly industrial -- not exactly the ideal hangout -- but it shouldn’t be all too crowded if you’re looking for some space to set up a camera. Perhaps the most ideal place for explosion-watching is Manhattan Avenue Park, stationed exactly where Manhattan Avenue meets the creek in Greenpoint. Not only will the park provide ample space to set up camp with snacks, cameras -- and all the caffeinated beverages you’ll need to keep your eyes open past 5am. If you’re looking to pregame, head to Troost just off of Green Street for a drink en route. The bar closes at 2am, don’t worry about arriving early -- according to legions of Facebook events, the area will likely serve as a meeting point for a pretty sizable number of dedicated Brooklynites (and a live DJ), hoping to mourn (or celebrate) the bridge in its final, greatest hour. Eliza Dumais has been waiting many months to watch the Kosciuszko explode. Follow her @elizadumais.